Gone is the lattice pylon, the first new design of an electricity pylon in 90 years has been erected in Nottinghamshire. The new pylon is shaped as a T with each arm carrying 60 tonnes. The new pylon stands at 120ft and is quite a bit smaller in correlation to the 165foot steel giants. Even though the tower may be short in stature, it is capable of operating at 400,000 volts and only takes 1 day to install rather than the week it would take for the bigger structures. The design was chosen after an international competition held by the National Grid in 2011 which was subsequently won by Danish company Bystrup. All runners up received £1,000 after the Department of Energy and Climate Change called for them to be both grounded and beautiful. 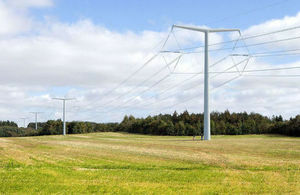 National Grid have stated that the new pylons needed to move away from coal and create low-carbon, green energy instead. They also claim that the pylons will be less obtrusive because of their shorter stature and the T shape which contours better to the surrounding land. Alan Large, the project manager stated that maintenance will be easier because operators will not have to climb up the towers, but instead they will be elevated up the sides. The surface of the new pylons will be smooth and impenetrable making them more difficult to vandalise. So far, the plan is not to have them replace the 88,000 lattice pylons around the UK, but rather use them principally in the construction of new power lines around England and Wales.